First, some historical context. Caroline of Ansbach (1683‑1737) was one of the most intelligent and influential royal women of the eighteenth century. Moulded by the intellectual ambitions of the Berlin court in which she grew up, and one of the noted beauties of her time, she was the most eligible woman of her generation. Initially wooed by Charles, Archduke of Austria, she eventually settled for a husband whose Protestant faith complemented her own ‑Prince Georg August of Hanover. While in Hanover she made a lasting connection with the young Handel, actively assisting in his appointment as Kapellmeister in 1710, and encouraging the composition of a set of Italian duet cantatas. When her father‑in ­law ascended the British throne in 1714 as George I, she became Princess of Wales and on his death in 1727, Queen of Great Britain and Ireland. Caroline used her time at court to encourage the development of the arts and sciences. Reading widely, she built a large library at St James's Palace, and presided over salons which attracted the likes of Alexander Pope and Isaac Newton. In the artistic sphere, Handel displayed his continued loyalty and affection by dedicating Giulio Cesare, one of his finest operas, to her. Caroline's patronage was of pivotal importance to the cultural life of the country, and her political influence was not far behind: she was sufficiently highly regarded to be elevated to the position of regent during George II's many absences in Hanover. Loved and revered widely in the country, her unexpectedly early death at the age of 54 brought forth genuine expressions of grief and the pithily ironic couplet: 'O Death, where is thy sting; To take the Queen and leave the King?'. 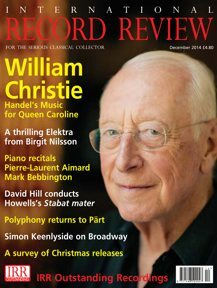 With a little bit of research one could put together numerous programmes reflecting Caroline’s personal musical interests and influence, but William Christie has opted for the obvious royal route, celebrating her life ‑ from arrival to funeral ‑ through the music which Handel wrote for major royal ceremonies. The Te Deum in D major, HWV280, was actually composed to welcome George I to London in Septembe 1714, but it was repeated the following month to mark the arrival of Princess Caroline, and is now generally referred to as the 'Caroline' Te Deum. Since it was intended for liturgical performance in the modest surroundings of the chapel at St James's Palace, the scale and scope of the music are less obviously expansive than Handel's preceding 'Utrecht' Te Deum, written for public rejoicing in the grand space of St Paul's. Christie calibrates his performance perfectly ‑ bringing swift movement to Handel's rapidly set verses (required for a liturgical performance), but allowing plenty of spacious swagger and grandeur in the big choruses supported by trumpets. In the second verse 'The glorious company of the apostles', tenor Sean Clayton sounds just a little stretched at the top of his register, but countertenor Tim Mead provides a gloriously focused and sustained tone in 'When thou tookest upon thee'. He keeps it simple here, but in the freer arioso of 'Vouchsafe, O Lord' there's room for a little more expressive latitude; there's just one passage in 'Day by day', in which Mead has to mirror the trumpet exactly, which sounds a little mechanical. Mead gets the lion's share of the solo work, since Handel originally sought to showcase the talents of countertenor Richard Elford, dubbed 'the most complete and agreeable Performer produced in this Age', when he died a few weeks later. The most familiar of the three works recorded here, and the least personal to Caroline, is the 1727 Coronation Anthem, 'The King shall rejoice', which was sung directly after the King's actual crowning. Though it's usually the choir which is to the fore in the punchy opening chorus, Christie shares the honours here between the singers and the trilling strings, fanfaring brass and resounding timpani. However democratic this may be in principle, in practice I rather missed the forward tone of the choir. But Christie makes a well‑judged contrast of style in 'Exceeding glad', which lilts gently, perhaps not making quite enough of the choral suspensions, but maintaining an almost spoken clarity in thehomophonic sections. In the next chorus the fugal phrase 'Thou hast prevented him' is neat but lacks real cumulative power, though this eventually arrives in the final 'Alleluia'. In sum, Christie's French forces are slightly softer‑edged, with less excitingly articulated choral singing, than many British choirs, but they find a dignified tenderness in the music which is often overlooked. The most substantial work here is The Ways of Zion do mourn ‑ the funeral anthem for Queen Caroline sung in Westminster Abbey in December 1737. For Handel, one of the most unusual features of his writing here are subtle allusions to a shared German heritage in the guise of two Lutheran chorales. The opening chorus ranks as one of Handel's finest, with a head‑motive derived from a funeral chorale often sung to the text 'Herr Jesu Christ, ich weiss gar wohl'. 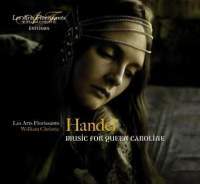 Christie makes much of the Germanic style Handel adopts, setting the chorale phrase in long notes in one part at a time, accompanied by rich counterpoint in the other voices. But Christie saves his emotional fire for the line 'and she is in bitterness, all her people sigh and hang down their heads to the ground'. The fierce harmonic power and emotional anguish come as a shock ‑ this is the moment that stands out above anything else in this performance as a sign of the deep affection once felt for Caroline. The main challenge for Christie and Les Arts Florissants in The Ways of Zion is to keep the interest and momentum alive throughout a multi‑sectional structure with restricted instrumental palette, an insistently subdued tone and no solos to relieve the texture. But Christie meets the challenge on, creating crests of passion which stand proud of the sea of misery: like the repeated ­cries of 'How are the mighty fallen' and moving climax as the chorus melts into a wordless orchestral postlude, which is all, to die away without losing its tonal richness ­and dignity. Christie's firm but gentle way with pace and passion in the funeral anthem ­is what really impresses here. The innate, if restrained, drama of the Old Testament text comes to life in a way which, for me. explains for the first time why Handel later ­reused The Ways of Zion as the first part of his oratorio Israel in Eqvpt. This is an ideal recording for those of us looking for a change from the enthusiastically full‑throated and highly articulated Handel singing we get from many British choirs. The singers of Les Arts Florissants may be less immediately exhilarating, but they are certainly sensitive to other forms of dignity and grandeur, especially in Caroline's funeral anthem. There were a few extraneous noises on my early‑edit review copy, but I trust these have been ironed out for the final release, which will be in plush new packaging from Les Arts Florissants Editions ‑ fit for a queen.